A new Japanese spy satellite has started beaming back images from North Korea as Tokyo steps up monitoring of its unpredictable neighbor. The images include pictures of North Korea’s suspected missile launch sites and nuclear facilities. 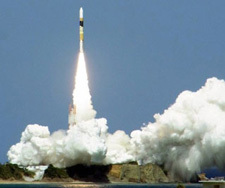 The [satellite] was launched from the Tanegashima Space Center, on a remote island off southern Japan on Sept. 23, and is orbiting at a height of 300 miles. The Japanese government… has declined to reveal details of the mission. The vehicle is the fourth “Information Gathering Satellite” to be launched since March 2003. The first satellite was put into orbit after North Korea fired a missile over Japan and into the Pacific Ocean in 1998. Ignoring international pressure, North Korea fired a Taepodong-2 missile – with an estimated range of 4,100 miles – in April 2009 and has carried out regular tests of short-range weapons since. According to experts, the $500.7 million satellite, built by Mitsubishi Electric Corp., is fitted with optical cameras and a telescope to provide images to the Japanese intelligence and defense authorities. The satellite is able to identify targets as small as 23 inches. Two of the earlier satellites have reached the end of their operational lives, but working with the surviving vehicle the new satellite will be tasked with providing advance warning of an imminent missile launch. 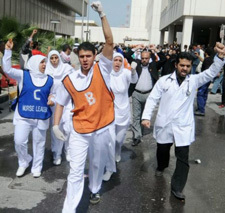 Doctors and nurses, protesting the arrest of other medics, near Salmaniya hospital in Manama, Bahrain, this spring. Bahrain has jailed 20 doctors for up to 15 years in a ruling critics attacked as revenge for their medical treatment of protesters during unrest in the Gulf kingdom. The doctors, who denied the charges, were among dozens of medical staff arrested during protests led by the island’s Shi’ite majority earlier this year demanding an end to sectarian discrimination and a greater say in government. Bahrain’s Sunni Muslim rulers quashed the protests in March, with the help of troops from fellow Sunni neighbours Saudi Arabia and the United Arab Emirates. At least 30 people were killed, hundreds wounded and more than 1,000 detained – mostly Shi’ites – in the crackdown. The doctors were charged with stealing medicine, stockpiling weapons and occupying a hospital during the unrest and in addition were jailed for forcibly occupying a hospital, spreading lies and false news, withholding treatment, inciting hatred of Bahrain’s rulers and calling for their overthrow. “We were shocked by the verdicts because we were expecting the doctors would be proved innocent of the crime of occupying the Salmaniya medical complex,” defense lawyer Mohsen al-Alawi said, adding the hearing had lasted no more than 10 minutes. The doctors say the charges were invented by the authorities to punish medical staff for treating people who took part in anti-government protests. “Those doctors who have been found guilty were charged with abusing the hospital for political purposes. Nobody is above the law,” a spokesman for the government’s Information Affairs Authority (IAA) said. Ten of the doctors, including senior physician Ali Al-Ekri, were given 15-year terms, two were sentenced to 10 years in prison and the rest to five. “After today’s verdict and those issued yesterday we feel pessimism,” Alawi said, adding they would appeal against the decision. Chinese athletes, spurred on in some cases by the [Chinese Communist] State sports system, have an unfortunate reputation for winning at any cost. Last year, at least 30 runners in Fujian [cheated] their way into the top 100 of the province’s International Marathon by hopping onto public transportation or by hiring ringers to stand in for them. Meanwhile, the Beijing Olympics in 2008 saw questionable judging in the shooting, gymnastics and boxing competitions and allegations that China had fielded under-age gymnasts. The latest controversies came in the south western province of Yunnan after officials detailed some of the cases they had uncovered in recent years. A report [from officials of the Yunnan Sports Bureau] said 110 athletes had faked their ages at the annual Provincial Games in 2010, many of them swimmers. Meanwhile, partial judging at a youth diving competition in August saw some divers given zero points by a panel of judges which included the captain and coach of rival teams. One former provincial diving coach, Hei Licang, admitted that he had been told by a “relative of a sports official” to “look after” a certain athlete. He said he had subsequently been [angered] when the diver did not take gold. In perhaps the most far-fetched example of cheating, however, a male team at the 2006 Ethnic Minority Games put on wigs to try to win the female dragon boat racing competition. Winning a gold medal at a large provincial sporting event often translates into financial reward for athletes and their coaches, including better housing and a good job after retirement. b) Why is the Japanese government monitoring North Korea’s missile and nuclear facilities? b) What charges were brought against the doctors? c) The doctors say they are innocent. What do they say is the government’s motive for sending them to jail? b) What is one likely reason that Chinese athletes cheat? BAHRAIN: Read a more detailed article about doctors in Bahrain getting jail time at: guardian.co.uk/world/2011/sep/29/bahrain-protester-death-sentence.